Welcome back to another Rental Car Review! As you may remember, last week I rented a 2015 Jeep Grand Cherokee Limited that I liked quite a bit. This week, as I perused the aisle at the Seattle Tacoma International Airport Rental Car Center, I was faced with a difficult choice. Do I pick a boring sedan or minivan? Do I pick a base model Ram 1500 or brand new base model 2016 Chevrolet Silverado? Or, do I pick the sister vehicle of the one I had last week? As you can probably tell by now, I went with the latter. Now, let’s go ahead and recap the “What Did I Rent?” game we played yesterday. If you’re not familiar, this is a game I play each week where I give you three hints and you have to try and guess what vehicle I’ve rented that week. If you’re right… You get fake internet points! Was first introduced as a body-on-frame SUV in 1997 (for the 1998 model year). It has since grown to a full size SUV (3 rows) and transitioned into a unibody construction (haven’t they all?). What makes it unique, is that even though it’s a unibody vehicle - it still has an available V8 engine. I don’t know of any other American unibody-direct competitors (outside of its corporate sibling) that offers a V8 anymore so this really makes it one of one. As you know, I enjoyed the Jeep that I had last week. Under the sheet metal, the Durango is just about identical. It shares the same 3.6L Pentastar V6, the same eight speed 845RE automatic, the same gear ratios, and the same overall towing abilities. It does not have the transfer case that the Jeep had but does offer full time AWD that is more than capable of getting you where you need to go. The interior is very similar as well. As I highlighted on my video review of the Jeep, the interior components and buttons and switchgear is identical to the Jeep Grand Cherokee and just about every other vehicle Chrysler currently makes. This isn’t anything new but it does get a little tiresome when the parts bin sharing is so obviously due to cutting costs. The Limited models of each respective vehicle are also almost identically equipped with regards to the paddle shifters, the Uconnect infotainment system, the heated seats, steering wheel, and type of leather used. One thing the Dodge does have the that Jeep doesn’t is the rotary-gear-selector. If you watched my video review last week, you know I wasn’t a huge fan of the Jeep’s gear selector so it’s nice to not have to deal with that again. Another point for the Dodge comes from the overall build quality and quiet ride. Once again, this is very similar to what I had to say about the Jeep but it’s nice to see that carry over to the larger of the corporate-siblings. I can’t really say too many bad things about the Durango as a vehicle. As I mentioned above the parts-sharing is getting old and I wish there was some diversity among the product lines and brands inside of FCA’s portfolio. Side note: The parts-sharing is so egregious that FCA used to share the exact same navigation unit from Ram to Ferrari. And I also believe that the ubiquitous window controls in my Durango (and in the Jeep, and in my Ram) are being used in the latest Maseratis. It’s not that the navigation unit or the window controls are bad but it reminds me of all the mid-90s to mid-2000s Fords that all had the exact same radio unit. I personally find it annoying and think that they can do much better. Anyway, enough with that rant. Another thing I’m not so stoked on with the Durango is the size of the thing. It’s not that much bigger than the Jeep but somehow manages to fit a third row of seats in the back. No adult-sized human can really fit back there comfortably and frankly I don’t think it’s necessary. The Durango is like some kind of middle-child trying to split the difference and fit in with both the older siblings and younger ones. Unfortunately it’s not working that well and somewhat loses its identity in the progress. The Durango of years past was a truck-based SUV with room and thirsty V8s. The new Durango is like a jacked-up Charger wagon that isn’t as nice to drive as a traditional wagon, and isn’t as efficient as a proper minivan. 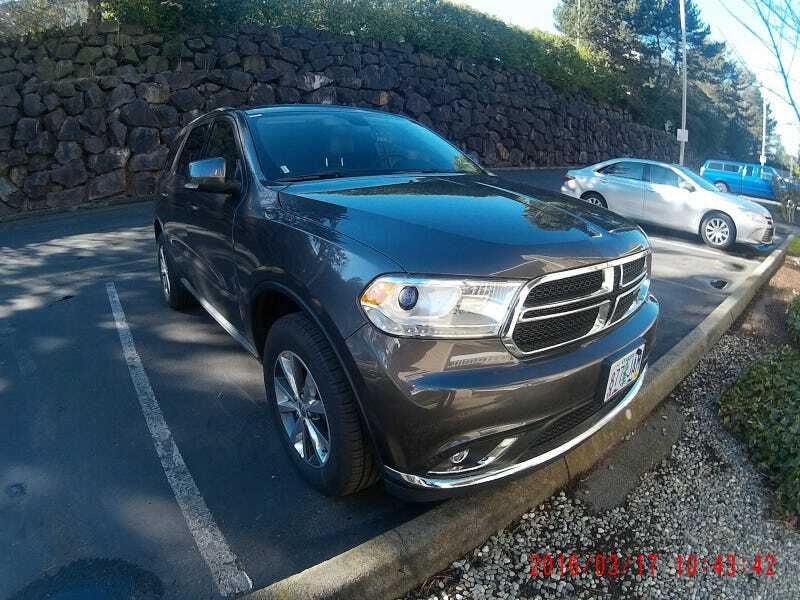 Now I know that crossovers are all the rage right now but somehow the Durango isn’t a very good one. It’s not good offroad (the old one came with a low range transfer case) and it’s not the best on road (center of gravity is too high to be a performance vehicle). It’s not as big as the GM competition and isn’t as wagon-y as the Ford Flex. It’s stuck in some kind of automotive purgatory without a solid identity or reason for existence and the sales numbers show it. The Jeep Grand Cherokee sold 195k units in the US in 2015. The Dodge Durango sold a miniscule 64k. In fact this latest generation of Durango has only sold 283k units since it came out in 2011 (those are US numbers, I don’t know if it is exported). Including exports, the Jeep Grand Cherokee sold 277k units last year alone. That’s quite a gap and once again just shows that the current Durango isn’t doing anything to really stand out in the market. The sister vehicle (with a very defined role/position in the market) is spanking the slightly bloated, non-defined, rather boring model and I think the majority of it comes down to the lack of positioning and not being able to fill a gap. I have mixed feelings on the Dodge Durango. On one hand I think it’s kind of cool. I like how it’s still available with a V8 and think that the R/T package makes it look pretty damn good. On the other hand, I’m not entirely sure why it’s still being built. It hasn’t sold well and really doesn’t excel at any one specific task (other than maybe having a V8 but even then, the Ecoboost in a Ford Flex makes more power…). It tries to be a macho SUV but in reality is just a worse version of a Charger wagon. It almost seems like Dodge tried to morph the old Magnum wagon with the last generation Durango and came out with this…. thing. Maybe I’m being harsh and judgemental but the Jeep I had last week was clearly defined for a certain niche in the market - and does quite a good job at fulfilling that role. Dodge needs to rethink the Durango and its role in the marketplace. That or hellcat-ify it and really provide a romping stomping SUV that can be marketed as a high-horsepowered street machine that has room for the 2.3 kids and a dog. That or give it the Ecodiesel and have a really efficient crossover. Or redesign it to be a big body-on-frame SUV that competes with the Suburban/Tahoe and the Expedition. Give that an Ecodiesel and watch the sales come rolling in. One other issue that I had that didn’t impact the review or the drive was an unfortunately placed nail in the road. It popped my left rear tire which is a pain. Thankfully the Durango comes with a spare (you’d be surprised as to how many vehicles don’t have them anymore) which looks ridiculous. What are your thoughts? Have you driven a new Durango? What do you think the target market is? Wanna watch my video review?